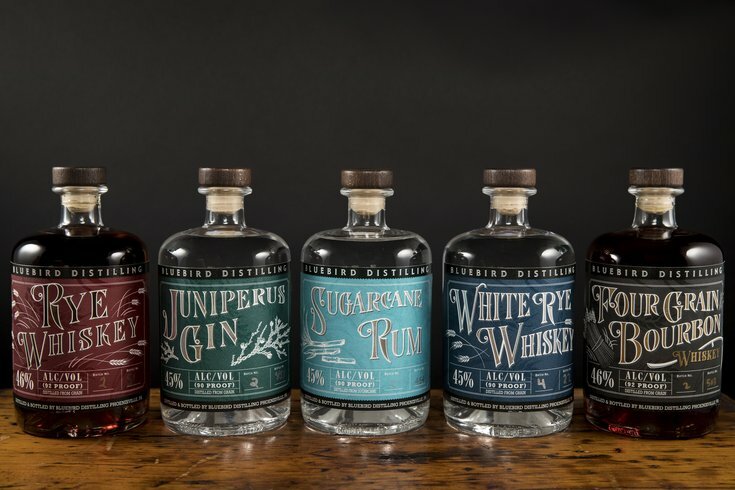 Bluebird Distilling's line of craft spirits. Have you ever wished you could combine the joy of alcohol and your favorite candy? Well, Bluebird Distilling and Philadelphia Brewing Co., are partnering to give you an opportunity to do just that. The two companies are offering a tasting adventure, "Beer, Booze, and Boos," at Philadelphia Brewing Co.'s The Peacock Room in Kensington that will surely delight your adult self and your inner child. RELATED READS: Not sure what to do for Halloween? Here's a list of 20 events in Philly | Target's new holiday shipping policy puts bullseye on Amazon | Infrequently Asked Questions: What is 'Fortnite' anyway? The menu will feature candy of all types, including everyone’s favorite Halloween fun-sized chocolates. Bluebird's Four Grain Bourbon, a classic corn, rye, and barley bourbon, can be paired with your choice of Hershey Kisses or a Snickers bar. Their classic Vodka will pair with Junior Mints. Philadelphia's Brewing Co.'s Kenzinger, a golden beer that combines pilsner malts with American noble hops, pairs with M&Ms, and the Twix will pair with the Walt Wit, a white ale with a slight hint of spice and citrus. But if you want something a little heartier with your alcohol, Oreos will pair with the Joe Coffee Porter, which is brewed with Passero’s coffee and chocolate malt. Want something a bit sweeter and a little more sugary? Bluebird Distillery pairs its Rye Whiskey, a classic rye, with Twizzlers, while its Juniperus Gin balances its flavors of juniper, cucumber and citrus with a dash of Sour Patch Kids. "Beer, Booze, and Boos" will be held on Monday, Oct. 29 from 6 to 8 p.m, at the Peacock Room, 2440 Frankford Ave.